Ponds and waterfalls create a tremendous landscape focal point or a private escape. Backyard ponds and waterfalls have grown in popularity as a landscaping amenity. Owners of both commercial and residential property are discovering the joy, pleasure and financial benefits that adding a pond and waterfall can afford. Whether you have an expansive lawn or a small garden, at Pro Cut Lawn Care & Landscape we will design a pond and waterfall to suit your lifestyle and budget. Ponds add beauty to your property and will be an attraction for family and friends, or employees and customers to enjoy. Ponds can also help you better market a home or business for sale and will increase the value of your property. Depending on the size of your pond, it can attract a variety of birds and amphibians. A pond can also be stocked with fish, native or koi, and aquatic plant life for all to enjoy. Aquatic plants are an important component of a ponds ecosystem along with a balance of fish, aeration, and filtration. 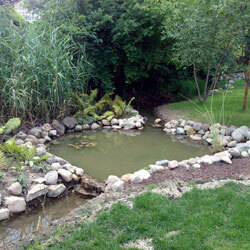 A waterfall feature in your pond can reduce algae and foul odors along with creating naturally calming sounds. The sound of a water fountain or of water cascading down rocks can be relaxing. A waterfall can be wonderful addition integrated into the design of your pond. If your property does not lend itself to the addition of a pond, waterfalls can also be built as a standalone feature. Either way, waterfalls are an excellent landscaping amenity that can add some nice visual and audio appeal to your yard. By building a pond or waterfall you can create your own personal escape. Listening to the running water can be soothing and relaxing, and learning about nature through the plants and animals you include can be an invigorating experience. Have you thought about having a pond or waterfall on your property? We will strive to enhance the look of your home or business, making it appealing to your guests or customers. 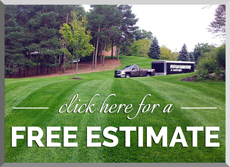 Contact the Grand Rapids pond and waterfall construction experts at Pro Cut Lawn Care & Landscape today free estimate or call us directly at 616.421.4148.